Warm wool winter coat, M&S size 16 Dark red, medium length, good condition,. Condition is Used. Dispatched with eBay delivery – Shutl 1 day. Lovely shape and color. in good condition. Marks and Spencer Red Wool Coat. Condition is Used. Dispatched with Royal Mail 2nd Class. Vintage M&S PURE WOOL Blazer Jacket Size 18 Red Military 1991 Double Breasted. Condition is good used. Dispatched with royal mail 2nd class. GREAT LOOKING JACKET.CENTRE BACK 24 IN.IMMACULATE. No collar style, mandarin neckline. LADIES RED WOOL COAT. Black satin lining. Up to 2kg is 3.10 Apr price rise . Large black button up front. Very good condition. Really useful short red Marks and Spencer pure wool jacket - really soft and snuggly. Lined in red polyester. Three large funky buttons down the front and one at the edge of each sleeve. Ladies M&S Classic Red Coat Wool Mix. Length from nape to hem 28". Pit to pit 22". Double breasted style fastening with gold buttons and a concealed inside button. luxurious red blazer in 100% wool. M&S Blazer Jacket. SIZE UK 14. fully lined in silky fabric. full length sleeves with gold buttons on the cuffs. Marks And Spencer Autograph Ladies Red Wool Coat/Jacket 14 Brand New. Marks And Spencer Autograph Ladies Red Wool Coat/Jacket 14. Condition is New with tags. Absolutely beautiful red wool jacket with tags, lovely red lining. Any questions please drop me a message. Many thanks for looking. 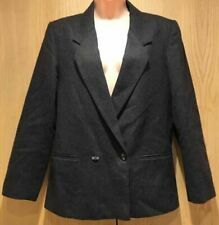 Ladies Size 14 Marks and Spencer Jacket. acyrilic and wool. ZipUp with stud at collar. red mix pattern. Tomato colour, a sort of orangish red. Hip length. Tailored shape. 45% acrylic, 44% polyester, 11% wool. Good weight, excellent quality fabric with wool content. Textured finish. A superb winter coat / jacket by M&S. For sale a gorgeous quality hip length jacket from Marks & Spencer. Red in colour with large black coloured button up fastening. Fabric content wool & viscose - lining to sleeves polyester. Two small front pockets with ruching pleat detail below (still stitched in place to hold shape). New and preloved clothing of exceptional style, quality and value. Marks and Spencer | Next | Dorothy Perkins | Prada | Gucci | Christian Louboutin. Pit to pit: 19”. Shoulder to sleeves: 24”. Womens Marks & Spencer Limited Edition Wool Coat Size 8. Burgundy double breasted coat with hidden popper fastening and 2 front pockets. Also has a pleat down the back. LADIES RED WOOL COAT SIZE 14. Marks and Spencers 83% Wool / 17% Polyamide Is in Good Condition Can post out royal mail 2nd class delivery service for additional £5.00 if preferred. M&S Women's Colour Block Stitch Cardigan with Wool NEW!! Wool jacket no rips or tears but has been stored so will require freshen up. Button front and ultra classic style so doesn’t go out of fashion. Pure wool and lined. Other designer items being listed please browse through. Hugh clearance of family clothing. Marks and Spencer Indigo Collection Heavy Weight Very Warm Red Winter Coat Size 12. Wool mix, 56% wool, 46% polyester. Coral red in colour. Arm length 80cm (from centre of shoulder to cuff). Pillar box red coat from marks, size 12, has a funnel neck collar for extra warmth. Wool blend. This is knee length , if you are over 5 ft 6 I would say this will come just above the knee. It's so elegant!! Jacket is Lined - 100% Polyester. 3 x Button fastening 1 x small neck button. Length 25.5" from top of shoulder. pit to pit 20". Bnwot Ladies Smart Red Wool Blazer From (St Michael) Marks And Spencer Size 16 Length from back of neck to bottom of hem is 30 inches not including collar Length of sleeve is 24 inches from shoulder seam to end of sleeve . Dispatched with Royal Mail 2nd Class Signed For. Stylish and warm. Size 14 - large buttons and concealed pockets at front. M&S Ladies Classic style red wool coat, size 14, it measures 32" in length. It has been used but still in good condition. We are a pet and smoke free home. Thanks for looking. Aztec design in beige, burgundy & Black. Wool Mix with Leather look edging. Great Jacket by M & S Collection. M&S Ted Wool Check Jacket Size 14/40. Condition is Used. Dispatched with Royal Mail 2nd Class. Bnwot Marks And Spencer Red wool Coat . Dispatched with eBay delivery – Shutl 1 day. Red Wool Jacket M&S Size 6 Petite. In very good used condition. Fitted style and lined. Dispatched with Royal Mail 2nd class signed for. Type: PEA COAT. Material: WOOL BLEND. Colour: RED. MARKS & SPENCER. PER UNA . LOVELY RED WOOL MIX COAT / JACKET . BUT JACKET MAY LOOK A SLIGHTLY DIFFERENT COLOUR DUE TO THE FLASH . 55% ACRYLIC. UNDERARM TO CUFF ~ 17 ". UNDERARM TO HEM ~ 19". You are looking at an AMAZING tailored jacket by M&S RRP £129 Cherry Red 100% Pure New Wool Suit Blazer Jacket Work Coat UK 10 38. In VERY GOOD condition, light wear. Main colour(s): Cherry Red. Re:Style started in the hope that we could play our role in the UK consuming fashion and textiles sustainably. Marks and Spencer red/ grey wool mix jacket blazer. SUPERB M&S RED WOOL LADIES COAT SIZE 14. It fastens with black buttons. 68% New Wool, 20% Acrylic, 12% Polyamide. Smart Button Up Jacket, coat with slightly padded shoulders. Total length from shoulder to bottom edge is 60cms. Stunning Red 100% Wool coat by Marks and Spencer classic collection. Beautiful Red Wool coat. Size 16 UK. - shoulder to shoulder 19". Total length .